Standard beading needles are very fine and long, with long eyes. 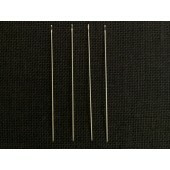 These needles are suitable to use with beads, pearls and sequins and they are particularly useful in the art of threading and stringing pearls. Short beading needles are ideal when attaching beads to fabric featuring additional embroidery.